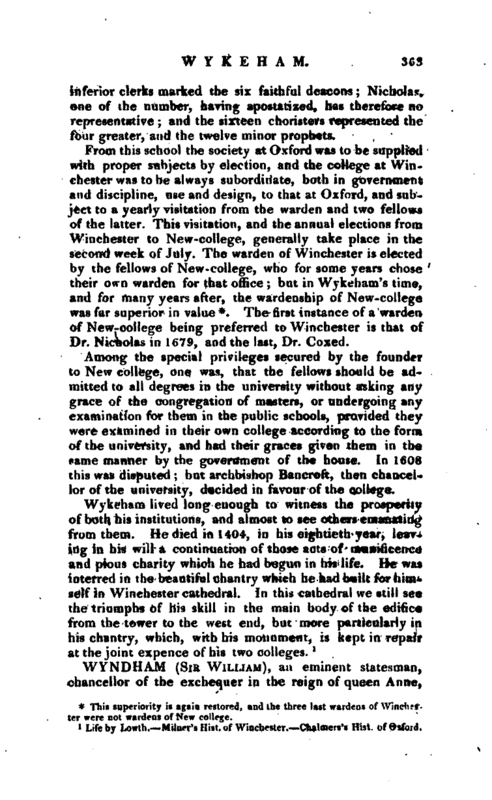 This superiority is again restored, and the three last wardens of Winchester were not wardens of New college. | was descended from a very ancient family, which derives its descent from Ailwardus, an eminent Saxon, in the county of Norfolk, soon after the Norman conquest, who being possessed of lands in Wymondham, or Wyndham, in that county, assumed his surname thence. Sir John Wyndham, who was knighted at the coronation of king Edward VI. had the estate of Orchard, in the county of Somerset, in right of his wife, Elizabeth, daughter and co-heir of John Sydenham, of Orchard, esq. His great grandson John married Catharine, daughter of Robert Hopton, esq. sister and co-heir to Ralph lord Hopton, by whom he had issue sir William Wyndham, advanced to the dignity of a baronet by king Charles II. 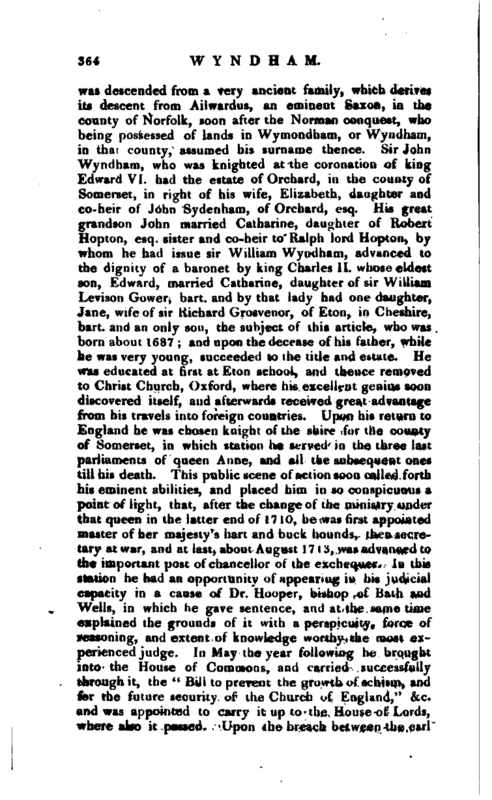 whose eldest son, Edward, married Catharine, daughter of sir William Levison Gower, bart. and by that lady had one daughter, Jane, wife of sir Richard Grosvenor, of Eton, in Cheshire, bart. and an only son, the subject of this article, who was born about 1687; and upon the decease of his father, while he was very young, succeeded to the title and estate. He was educated at first at Eton school, and thence removed to Christ Church, Oxford, where his excellent genius soon discovered itself, and afterwards received great advantage from his travels into foreign countries. Upon his return to England he was chosen knight of the shire for the county of Somerset, in which station he served in the three last parliaments of queen Anne, and all the subsequent ones till his death. This public scene of action soon called forth his eminent abilities, and placed him in so conspicuous a point of light, that, after the change of the ministry under that queen in the latter end of 1710, he was first appointed master of her majesty’s hart and buck hounds, then secretary at war, and at last, about August 1713, was advanced to the important post of chancellor of the exchequer. 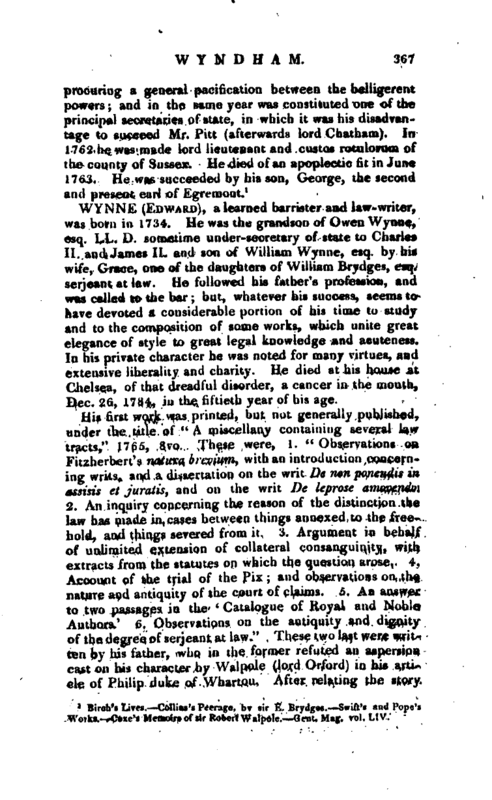 In this station he had an opportunity of appearing in his judicial capacity in a cause of Dr/Hooper, bishop of Bath and Wells, in which he gave sentence, and at the same time explained the grounds of it with a perspicuity, force of reasoning, and extent of knowledge worthy the most experienced judge. In May the year following he brought into the House of Commons, and carried successfully through it, the “Bvll to prevent tae growth of schism, and for the future security of the Church of England,” &c. and was appointed to carry it up to the House of Lords, where also it passed. Upon the breach between the earl | of Oxford, lord high treasurer, and lord Bolidgbroke, secretary of state, in July 1714, sir William adhered to the interests of the latter. Upon the death of (jueen Anne, on the 1st of August 1714, he signed with others the proclamation of his majesty king George I. and on the 13th of that month seconded a motion made in the House of Commons by Horatio Walpole, esq. for the payment of the arrears due to the Hanoverian troops in the English service. However, in October following he was removed from his post of chancellor of the exchequer, which was conferred upon sir Richard Onslow. In the next parliament, which met on the 17th of March 1714-15, he appeared very vigorous in opposition to the measures of the administration, and in defence of the peace of Utrecht; and on the 6th of April made a motion, that the House would appoint a day to take into consideration his majesty’s proclamation of the 15th of January, for calling a new parliament, which reflected on the conduct of the last ministry of queen Anne, and which he represented as unprecedented and unwarrantable, and even of dangerous consequence to the very being of parliament; expressions which gave such offence to the majority of the house, that he was ordered to receive a reprimand from the speaker. He spake likewise in favour of the duke of Orrnond and the earls of Oxford and Strafford, when they were impeached in that house. But, upon the breaking out of the rebellion in Scotland under the earl of Mar, in August 1715, sir William. fell under suspicion; on which account he was seized oil the 21st of September at his house at Orchard Wyndham, in Somersetshire, by colonel Huske, and one of his majesty’s messengers; from whom making an escape, a proclamation was issued out for his apprehension. 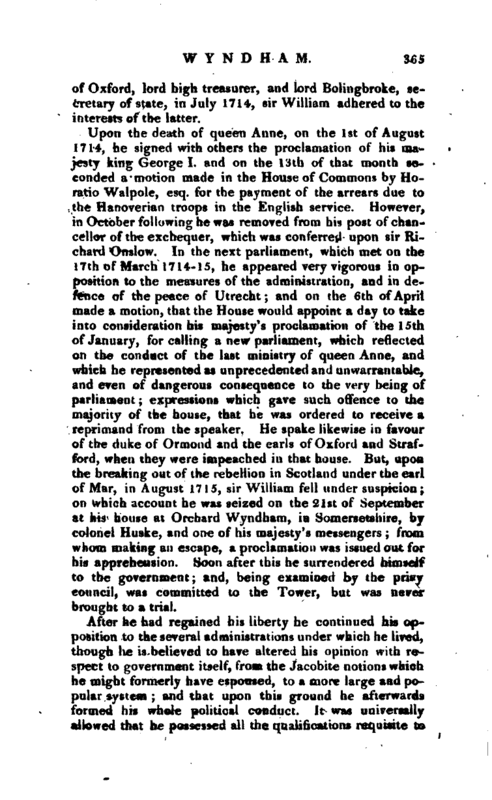 Soon after this he surrendered himseif to the government; and, being examined by the privy council, was committed to the Tower, but was never brought to a trial. After he had regained his liberty he continued his opposition to the several administrations under which he lived, though he is believed to have altered his opinion with respect to government itself, from the Jacobite notions which he might formerly have espoused, to a more large and popular system; and that upon this ground he afterwards formed his whole Apolitical conduct. Jt was universally allowed that he possessed all the qualifications requisite to | form an able senator; sagacity, to discern the strength or weakness of every question, and eloquence, to enforce the one and expose the other; skill and address, to seize every advantage in the course of a debate, without affording any; and a proper degree of warmth and vivacity in speaking, necessary to secure the attention of the audience, without such an excess of it as might embarrass himself, and expose him to the cooler observation of his antagonists. And if we descend to the consideration of him in the more familiar light of his private conversation, we shall find it equally distinguished by an unaffected civility and politeness, enlivened by an easy flow of elegant wit, and supported by a various and extensive fund of useful knowledge. To so imperfect a character of him, it will be but justice to subjoin that which has been given by Pope, with whom he lived in great intimacy. 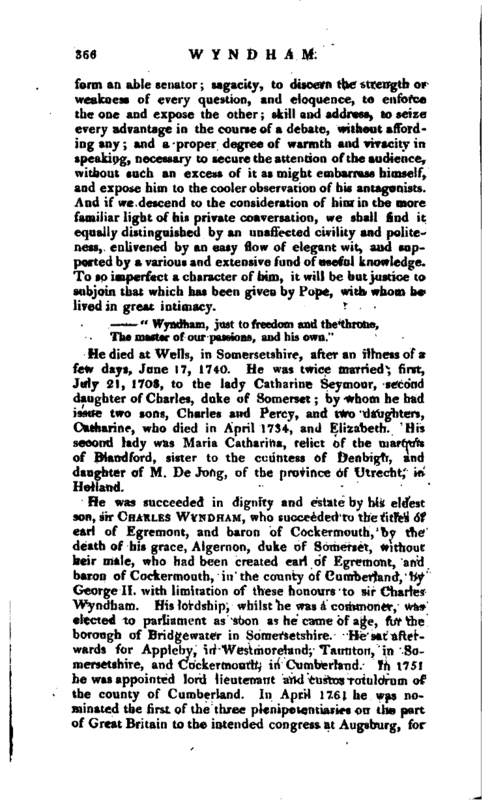 He died at Wells, in Somersetshire, after an illness of a few days, June 17, 1740. He was twice married; first, July 21, 1708, to the lady Catharine Seymour, second daughter of Charles, duke of Somerset; by whom he had issue two sons, Charles and Percy, and two daughters, Catharine, who died in April. 1734, and Elizabeth. His. second lady was Maria Catharina, relict of the marquis of Blandford, sister to the countess of Denbigh, and daughter of M. De Jong, of the province of Utrecht, in Holland. 1 Birch’s Lives. Collie’s Peerage, hv sir E. Brydges. Swift’s and Pope’s Works. Coxe’s Memoirs of sir Robert Walpole. —Gent, Mag. vol. LIV.